DHL’s investment in the 777 Freighters is a direct answer to the growing demand for global express capacity. 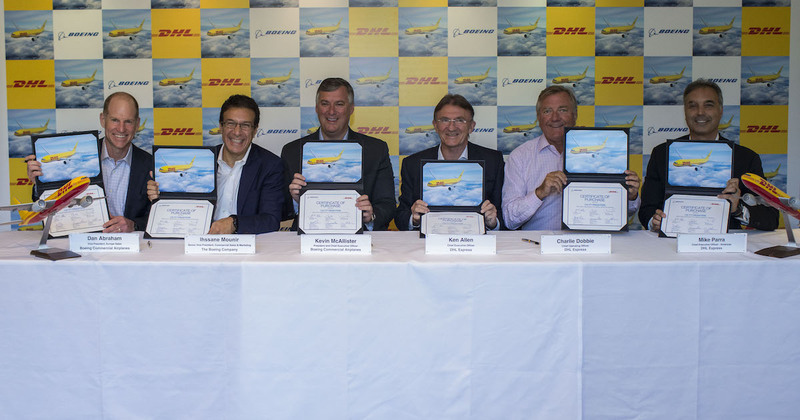 At the Farnborough International Airshow, DHL Express announced today an order for 14 Boeing 777 Freighters, which also includes options and purchase rights for 7 additional aircraft. The delivery of the first four planes is expected to be completed in 2019. “The acquisition of the 14 Boeing airplanes reflects a gradual replacement of our older intercontinental fleet. As the most fuel-efficient, most reliable freighter type with the best long-haul range, these aircraft will contribute to our emissions reduction targets and allow us to serve even more markets with non-stop flights. DHL was an early adopter of this type of aircraft for the logistics industry and took delivery of the 3rd B777F produced by Boeing in 2009. With extensive experience operating this freighter type, it has proven to be superior in all aspects of operation making it a logical choice,” explains Ken Allen, CEO, DHL Express. Overall, these 14 intercontinental plane replacements are capacity neutral, but operational wise with significant cost, efficiency and reliability benefits. And, while DHL Express in the past has chiefly been leasing aircraft to operate its global network on the routes, the purchase of fully owned freighter aircraft will improve the cost position of the DHL Express division going forward. For 2018, pre-payments have already been included in the group Capex guidance. Expanding cross-border e-commerce sales will grow to $4.48 trillion by 2021, which means a growth of 19.2 per cent per year. DHL’s investment in the 777 Freighters is a direct answer to the growing demand for global express capacity. Being the largest twin-engine cargo airplanes in the world, Boeing’s 777 Freighters are capable of flying 4,900 nautical miles (9,070 kilometers) with a cargo load of 102 tons. These state-of-the-art aircraft will reduce CO2 emissions by 18 per cent versus the aircraft being replaced. This will help us to contribute to greater sustainability in line with our climate protection target which is to reduce all logistics-related emissions to zero by the year 2050. DHL Express operates over 260 dedicated aircraft with 17 partner airlines on over 600 daily flights across 220 countries.